Point of Sale System: The point of sale system allows an Opencart online store owner to have one or multiple outlets of the store. The store owner can assign one or multiple user agents for each outlet. The admin can assign products to each outlet according to the requirement. The user agents have their POS panel to handle the orders and transactions of their respective outlet. The OpenCart POS panel can work on both online and offline mode to give seamless functionality. The Opencart Marketplace Point of Sale System (POS) gives the same features for the marketplace environment. Opencart Marketplace Point of Sale System (POS) expands the scope of the point of sale system by covering the sellers of your Opencart online store. Now your sellers can have the outlet which can be managed by them. The seller can enable products for POS. The seller can decide product’s quantity which will be used in their POS. 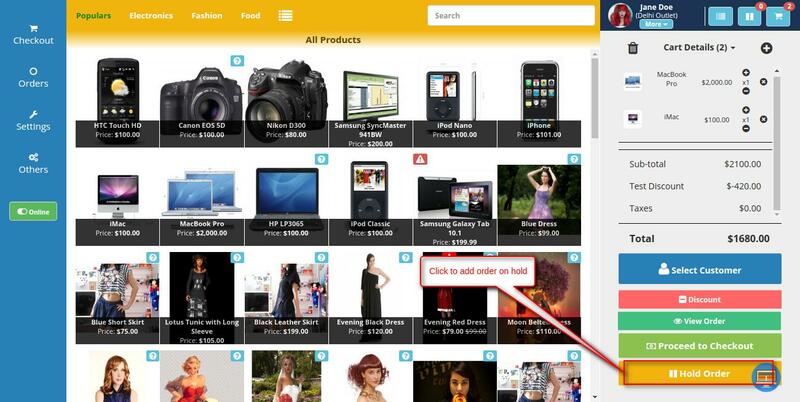 You can choose to display sellers products on your admin outlet POS panel. You can manage your suppliers and supply demand for your admin outlets. Opencart Marketplace Point of Sale System (POS) panel can work on both online and offline mode to give seamless functionality. Opencart Marketplace Point of Sale System (POS) is an add-on of Opencart Marketplace. You must have Opencart Marketplace installed for using this add-on module. The admin can create one or more outlets. 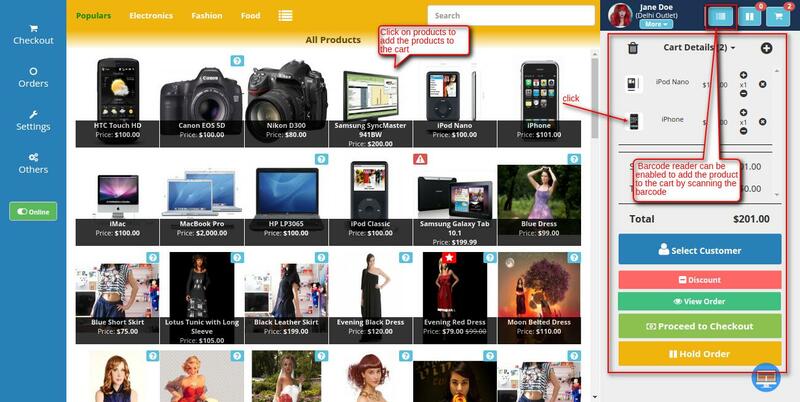 The admin can choose to display sellers product on his/her outlet POS panel. Admin-outlet dedicated admin agents to handle the admin’s outlets. The admin can manage POS products and their quantity. The admin can manage the POS orders. Supply management for the admin to manage suppliers and supply demands. The admin can generate and manage barcodes for the POS products. The login screen of the POS can be configured by the admin. Low stock quantity can be set by the admin. The agent can request for the products on the basis of the low stock quantity set by the admin. 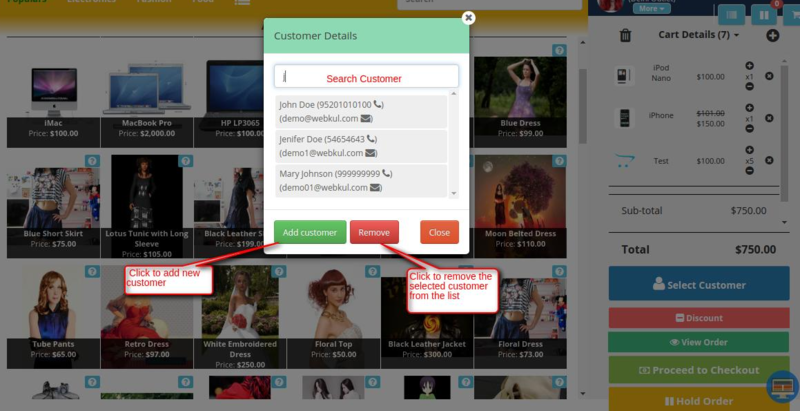 The admin can allow the sellers to add/use customer for POS system. Payment methods and their order completion status can be managed by the admin. 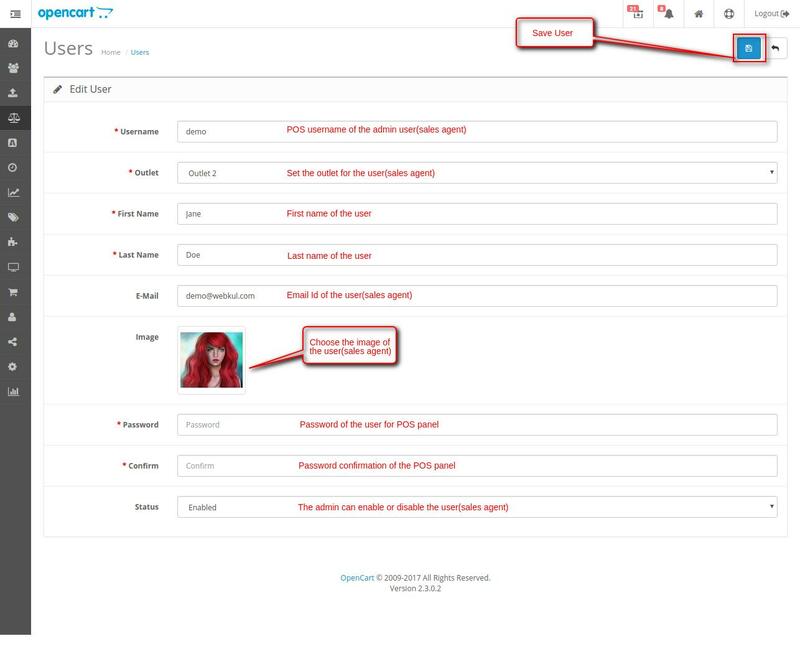 The admin can configure and manage the customer receipt contents according to the requirement. 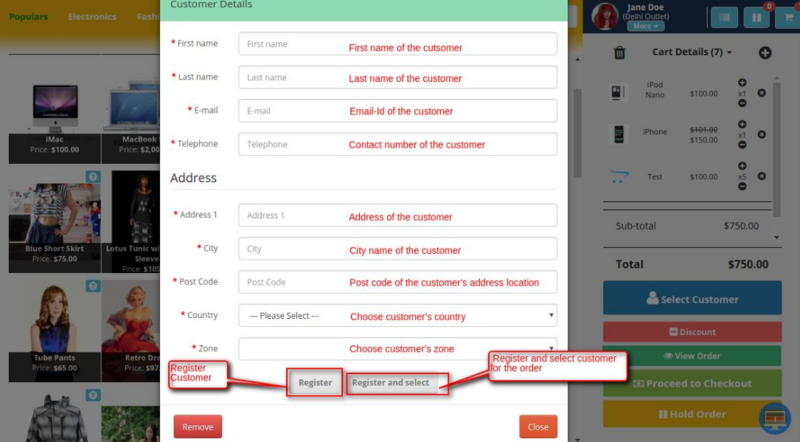 The admin can create a default customer for the orders which do not have any customers assigned to it. Sellers can have the POS outlet. One or more products can be assigned to an outlet according to the requirement by the seller. Seller can handle orders and transaction via POS panel. Sellers can manage his/her POS products and their quantity. POS login option from the seller’s panel. The POS panel can work on both online and offline mode for providing seamless functionality. The seller can hold any order for the later processes to carry out or handle more urgent orders. Price of the products can be changed in the cart by the seller according to the requirement. Easy real-time offline and online data synchronization. Barcode scanner input available to add products to the cart. The Opencart Marketplace POS connects only to the Printer, and barcode reader, whereas it doesn’t connect directly with the cash drawer and card swapping machine. POS requires a browser to work on it. POS supports 7.5 screen size minimum. New customer cannot be added in offline mode. Installation of the Opencart Marketplace POS System module is very simple. 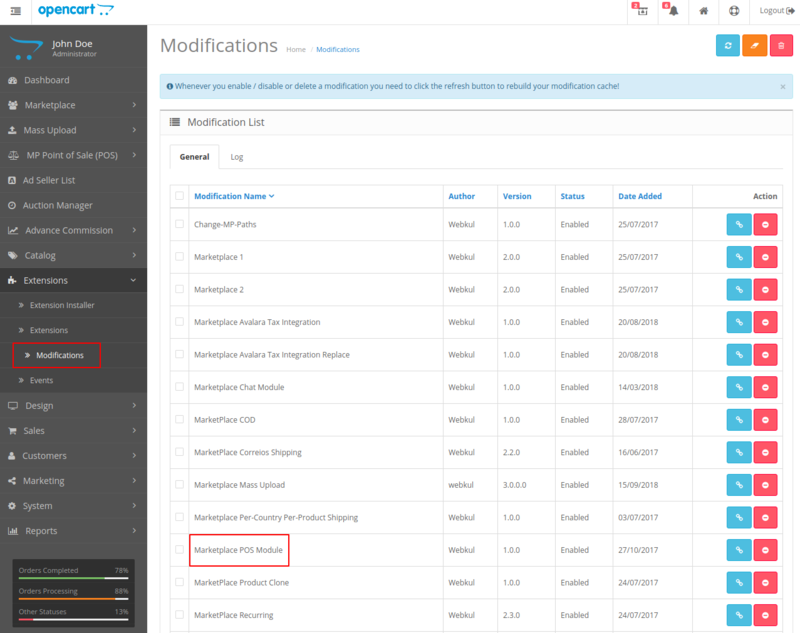 You just need to move or upload the admin, catalog, image and mppos folders into the OpenCart root folder. After transferring the folders, use extension installer for uploading the XML file- mppos.ocmod.xml which you will find in ocmod folder. 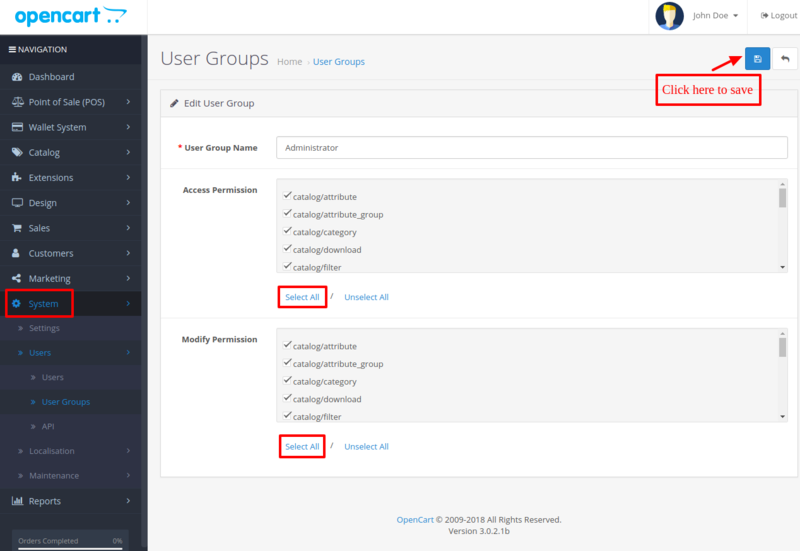 After that in Admin panel go to System -> Users -> Usergroup and edit ‘Administrator’ and choose to select all for both Access and Modify Permission and save it. 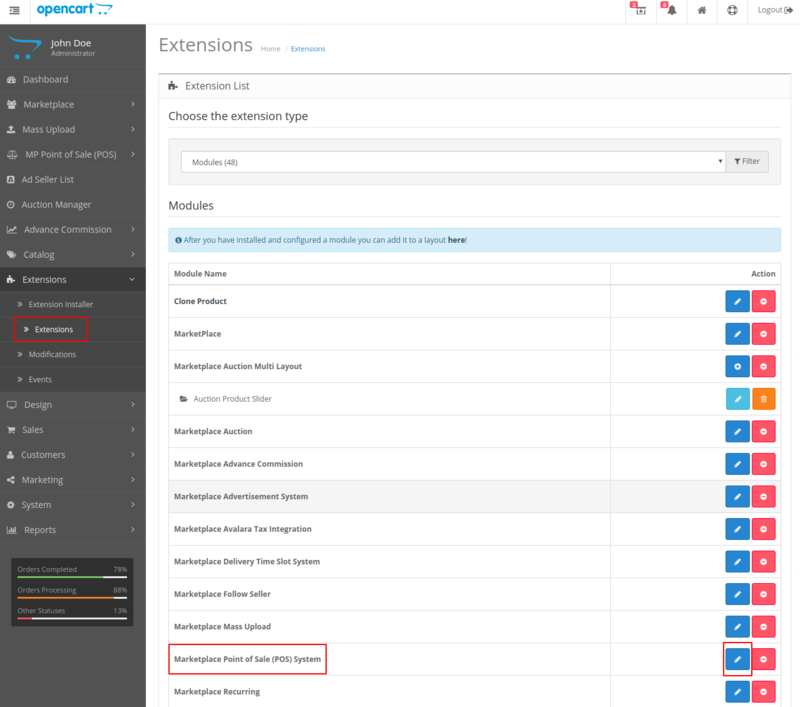 After that under Extension > Module, you can install or uninstall the module and can edit the module. 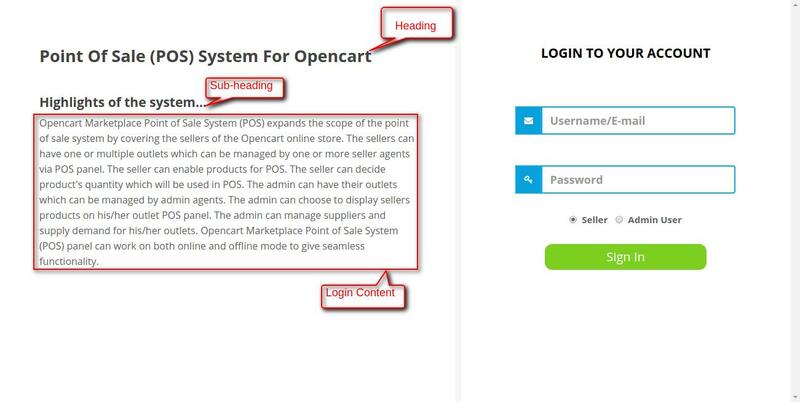 The admin can configure the Opencart Marketplace Point of Sale System (POS) module by navigating through Extensions > Modules(Extension Type) > Marketplace Point of Sale (POS) System. The module configuration has five sections to configure. The first section is the general section. Status: The admin can enable or disable the module. Store Country: Country name where the store is located. Store Region / State: Region / State name where the store is located. Heading on Login: Set the primary heading of the login page. Sub-heading on Login: The admin can also set the secondary heading of the login page. Login Content: The admin can provide read-only content for the login page. No. of Popular Products: Set the maximum number of the product that will be visible on the popular products. Quantity for Low Stock Warning: The admin can set the low stock quantity threshold for the POS products. Send Order E-mail to Sales Agent/Seller: The admin can allow or disallow order emails to the sales agent/seller. Show Seller’s Details on POS Invoice: The admin can enable or disable the display of seller’s detail on POS Invoice. Only Use Admin’s Products for Admin Outlet: If this field is enabled then only admin products will be displayed in the admin outlet. But if this field is disabled then admin can also display seller’s products on his/her outlet. 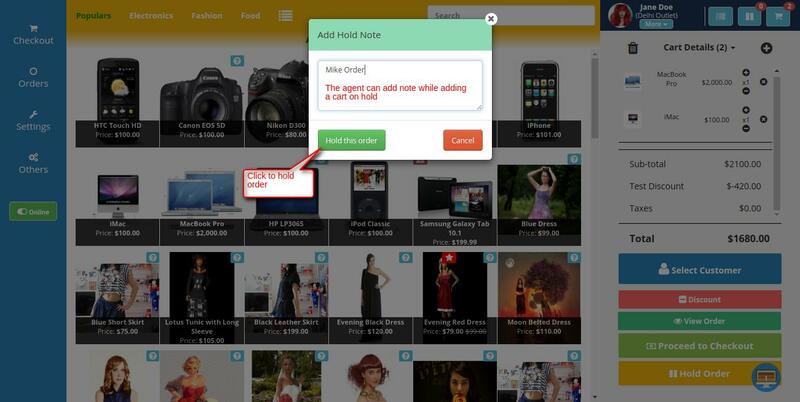 Allow Seller to Add/Use Customer: The admin can allow seller’s and seller agent to add/use customer in POS system. 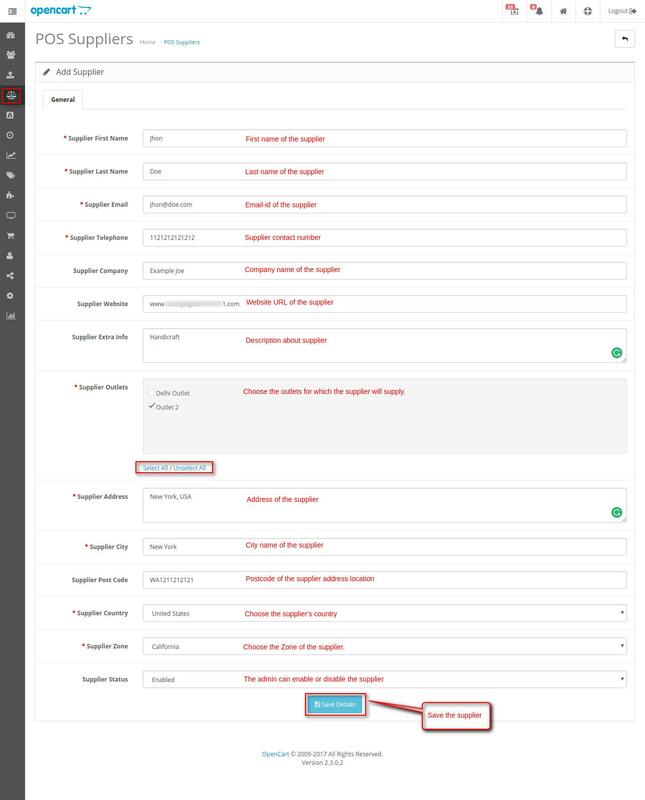 Admin can check heading, sub-heading, and content after saving configuration by redirecting to the POS login page by clicking on “POS Front End” button. The second section is customer settings. 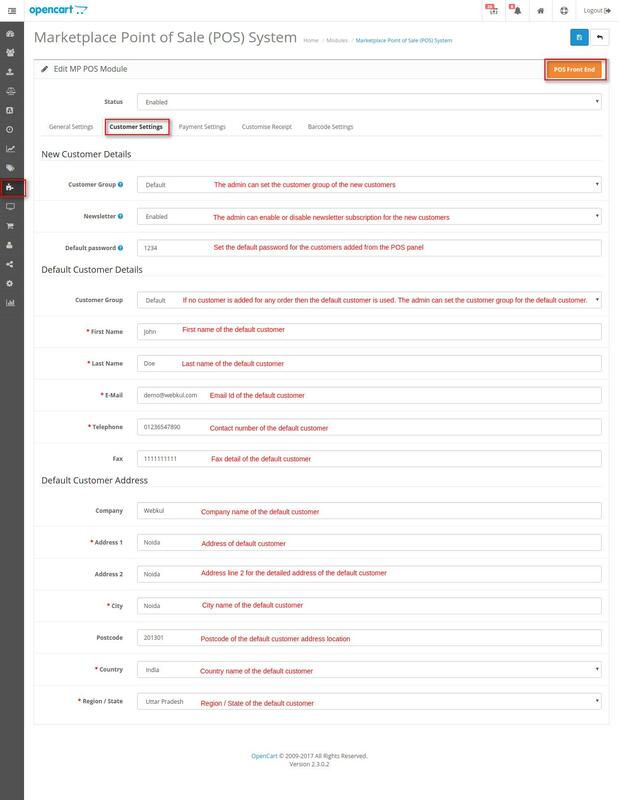 Customer Group: The admin can set the customer group for the new customers. Newsletter: The admin can enable or disable newsletter subscription for the new customers. Default Password: The admin can set the default password for the customers added from the POS panel. Default Customer Details: If no customer is added or used in any order of POS then the order is made by using default customer as the customer. Customer Group: The admin can set the customer group for the default customer. First Name: Provide the first name of the default customer. Last Name: Provide the last name of the default customer. E-mail: Set the email id of the default customer. Telephone: Contact number of the default customer. Fax: Fax detail of the default customer. Company: Company name of the default customer. Address 1: Address line 1 of the default customer. Address 2: Address line 2 of the default customer for detailed address information. City: City name of the default customer. Postcode: Postcode of the default customer address location. Country: Country name of the default customer. Region / State: Region / state name of the default customer. The third section is payment setting. Cash Status: The admin can enable or disable cash payment method. Cash Title: The admin can set the title for the cash payment method which will be displayed on POS panel. Cash Complete Order Status: The admin can choose cash order completion status. Card Payment Status: The admin can enable or disable card payment method. Card Payment Title: The admin can set the title for the card payment method which will be displayed on POS panel. Card Payment Complete Order Status: The admin can choose card order completion status. 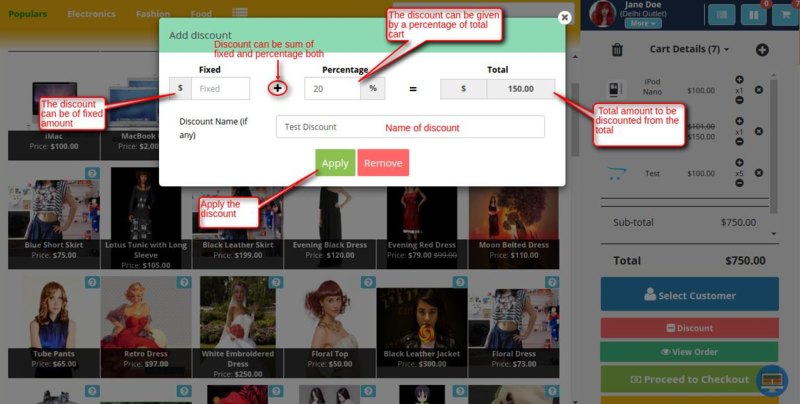 Discount Status: The admin can enable or disable discount option for POS. Discount Sort Order: Set the sorting order at which the discount part will come in order total and subtotal area. Coupon Status: The admin can allow and disallow coupon usage for the POS. Tax Status: The admin can enable or disable tax for the POS. The fourth section is customer receipt. The admin can choose the details displayed on the customer receipt of POS according to the requirements. The admin has 10 content which can be set to “Yes” to enable its display on the customer receipt. The admin can also set “No” to disable the display of the respective content. Extra Information: The admin can also provide extra information on the customer receipt like TIN no., GST registration detail, etc. The fifth section is barcode setting section. Barcode Width: The admin can set the barcode width(in pixels). Print Product Name With Barcode: The admin can set this field to “Yes” to enable the display of product name with the barcode else “No” to disable the display of product name with the barcode. Lastly, the admin can save the POS module configuration by Save button icon. After clicking on Add Outlet button the admin will be redirected to the add outlet page. Outlet Name: Set the name of the outlet. Outlet Address: Provide the address of the outlet. Outlet Status: The admin can enable or disable the outlet. The admin can manage outlet products by navigating through POS Outlets > Manage Products(of required outlet). After clicking the Manage Product icon the admin will be redirected to manage outlet product page. 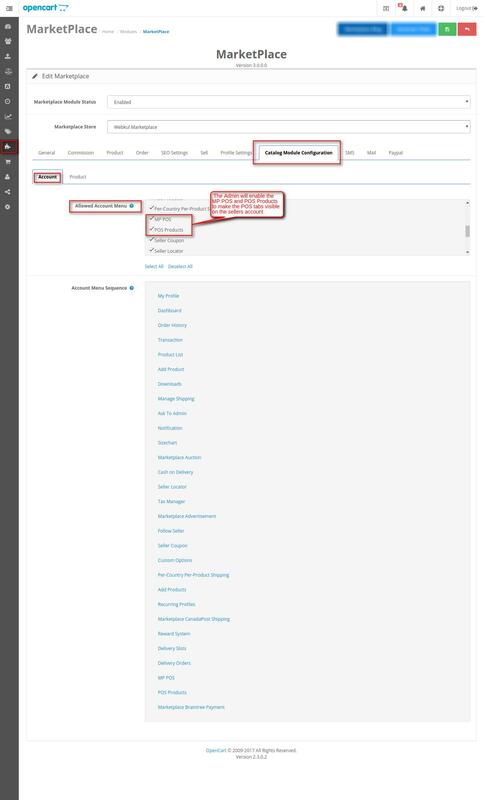 The admin can search the products for adding or managing the product for the outlet. The products can be searched by filter created on the basis of Product Name, Model, Price and Status of the product. 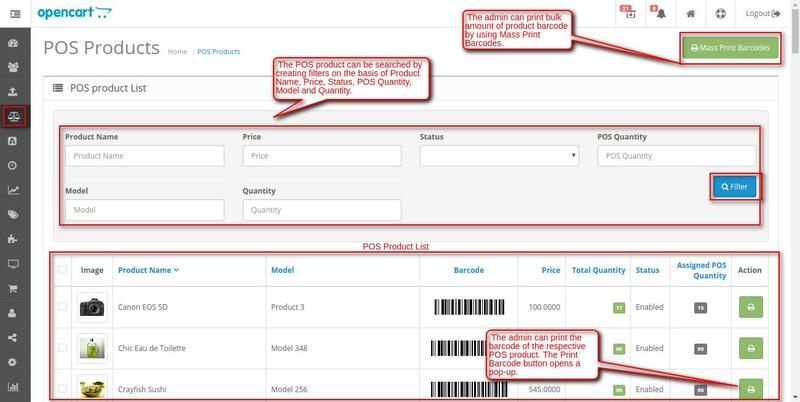 The admin can add the products to the outlet by enabling the product from the POS Status column. The admin can assign the quantity of the product for the POS of the respective outlet via Assigned POS Quantity Column. Lastly, the admin will save the outlet with the products. The admin can also Edit any outlet via Edit button present at the outlet list. The admin can delete the selected outlets via “Delete Outlet” button. After clicking the Add Users button the admin will be redirected to the add users page. Username: Set the POS username of the admin user. Outlet: Set the outlet for which the user is been created. First Name: First name of the admin user. Last Name: Last name of the admin user. E-Mail: Provide the email id of the admin user. Image: The admin can set the image of the admin user. Password: Set the admin user password for the POS panel. Confirm: Confirm the user admin password for the POS panel. Status: The admin can enable or disable the admin user. Lastly, the admin can Save the admin user. The admin can also Delete or Edit the selected admin users via Delete Users and Edit Users button successfully. The admin can search the POS product by using filters based on Product Name, Price, Status, POS quantity, Model, and Quantity. 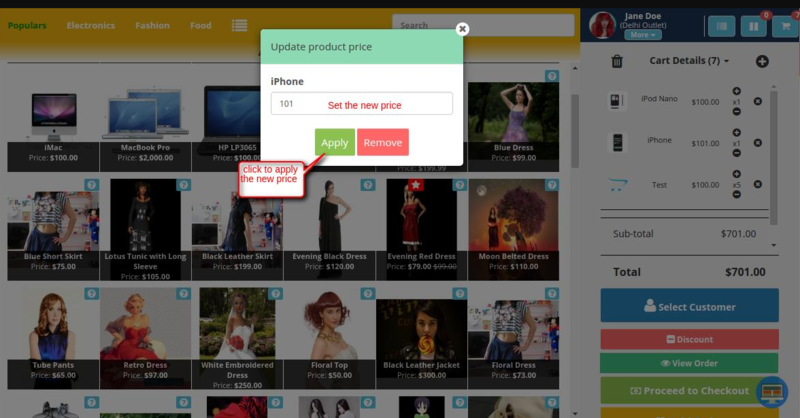 The admin can see the details of the POS products from the informative columns of POS product list like Image of the product, Product Name, Price, Status, POS quantity, Model, and Total Quantity. The admin can print the barcode of the product by clicking on Print Barcode button in the “Action” column. After clicking the Print Barcode button of the POS product a pop-up window appears. The admin can provide the number copies required for the POS product’s barcode. The admin can print the barcode of the selected product from the Product List by clicking on Mass Print Barcode button. After clicking the Mass Print Barcode button of the POS product a pop-up window appears. The admin can provide the number copies required for the selected POS product’s barcode. 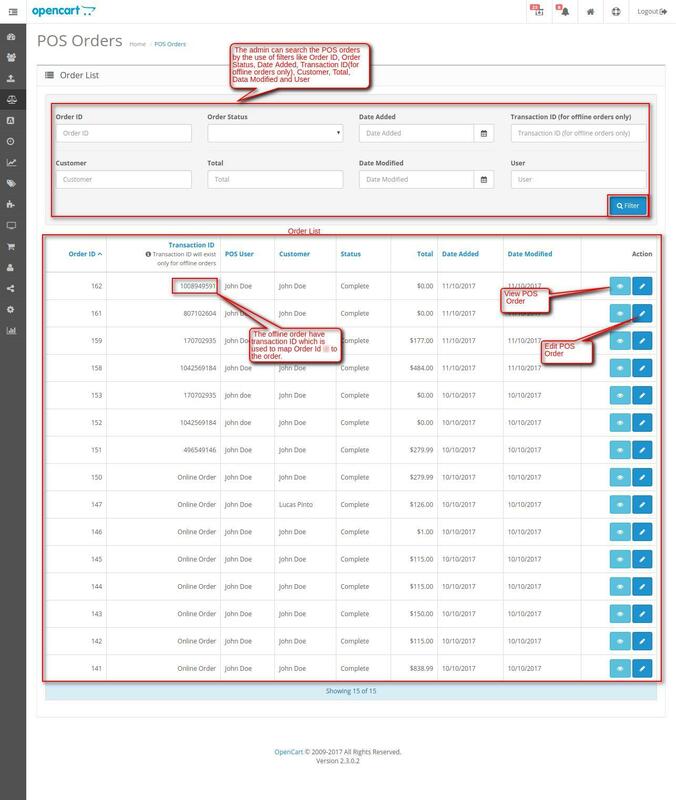 The admin can search the POS orders by using filters based on Order ID, Order Status, Date Added, Transaction ID, Customer, Total, Date Modified and User. The admin can see the details of the POS order from the informative columns of POS Order List like order ID, Order Status, Date Added, Transaction ID, Customer, Total, Date Modified and User. Transaction ID with Online Order status is generated when the POS system is connected to the internet (Online Mode) and Transaction ID with a unique number is generated when the POS system was not connected to the internet (Offline Mode). 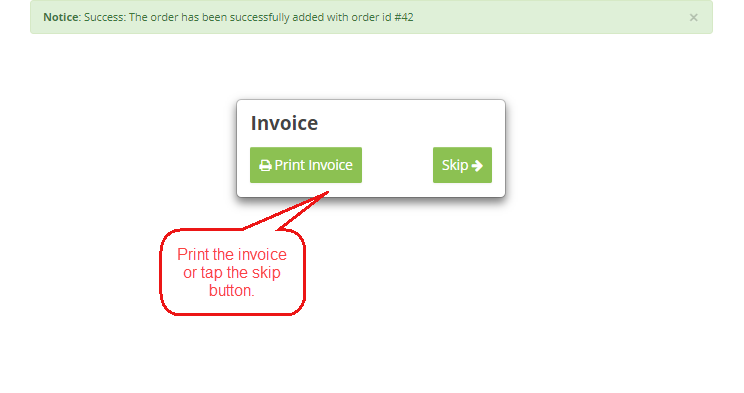 The admin can View and Edit order via View POS Order and Edit POS Order button. The admin can manage the supply of POS products by creating and managing POS product suppliers. The admin can manage the POS product demand raised by the POS admin user. The admin can approve the supply-demand or disapprove the supply demand. After clicking on Add Suppliers button the admin will be redirected to the add supplier page. Supplier First Name: Provide the first name of the supplier. Supplier Last Name: Provide the last name of the supplier. Supplier Email: Email Id of the supplier. Supplier Telephone: Provide the supplier’s phone number. Supplier Company: Provide the company name of the supplier. Supplier Website: Provide the URL of the supplier’s company. Supplier Extra Info: The admin can provide an extra description of the supplier. Supplier Outlet: Choose the outlet for which the supplier will do the supply. Supplier Address: Provide the supplier’s address. Supplier Post Code: Postcode of the supplier’s address location. Supplier Country: Choose the supplier’s country. Supplier Zone: Choose the supplier’s zone. 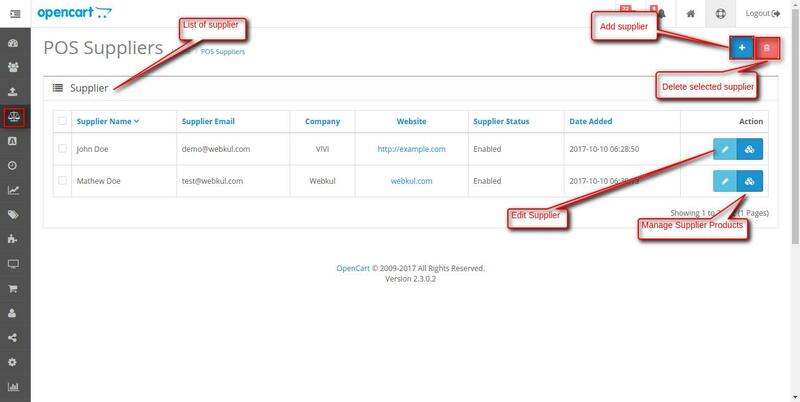 Supplier Status: The admin can enable or disable the supplier. Lastly, the admin can Save the supplier via Save Supplier button. Manage Supplier Products: The admin can add/remove POS product for supply from the respective supplier. The admin can restrict the minimum and the maximum quantity of the product supply from the supplier(Product Wise). 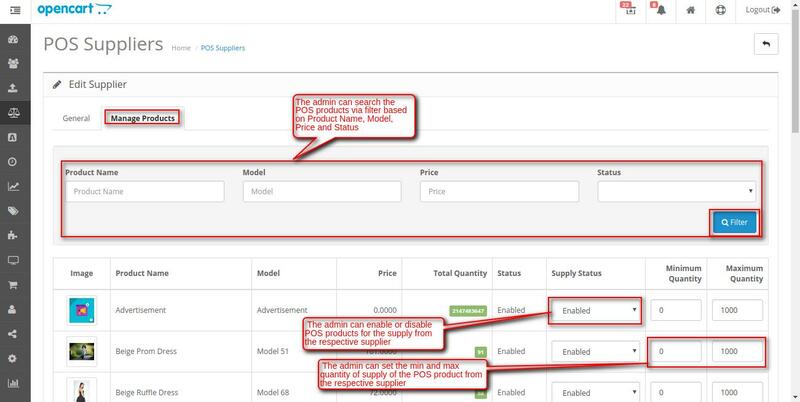 The admin can search POS products by using the filter based on Product Name, Model, Price, and Status. The admin can enable or disable products for supply from the respective supplier via drop-down options in the rows of “Supply Status” column. The admin can restrict the quantity of supply of a product by providing the minimum quantity and maximum quantity of product that can be supplied by the supplier. After the admin has set the low stock quantity for the POS products. The admin agent can see the low stock products separately by navigating through Marketplace POS tab > Supply Management > POS Supply Requests and from there only they can raise the supply request for the product. The admin can view the supply request via View button in “Action” column. Approve button in “Action” column to approve the supply request. 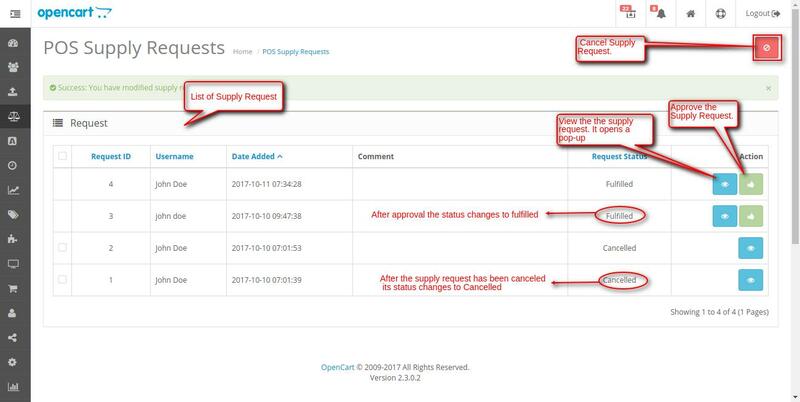 The admin can cancel the selected uncancelled supply request from the list of supply request via Cancel button. 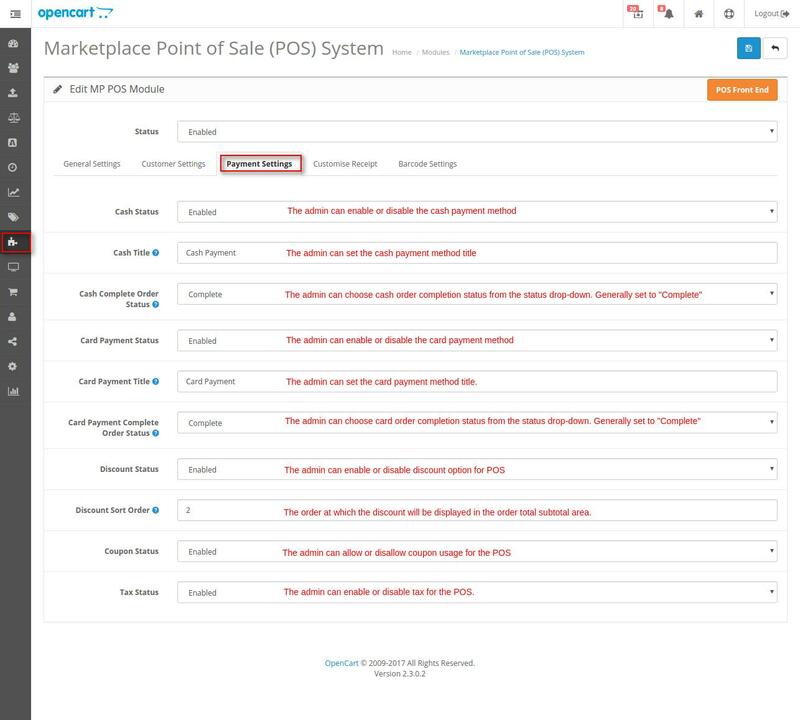 The admin can enable the POS menu tabs for the seller by navigating through Extension > Module(Extension Type) > MarketPlace > Catalog Module Configuration. Select the “MP POS” and “POS Product” from “Allow Account Menu” option and save the configuration. 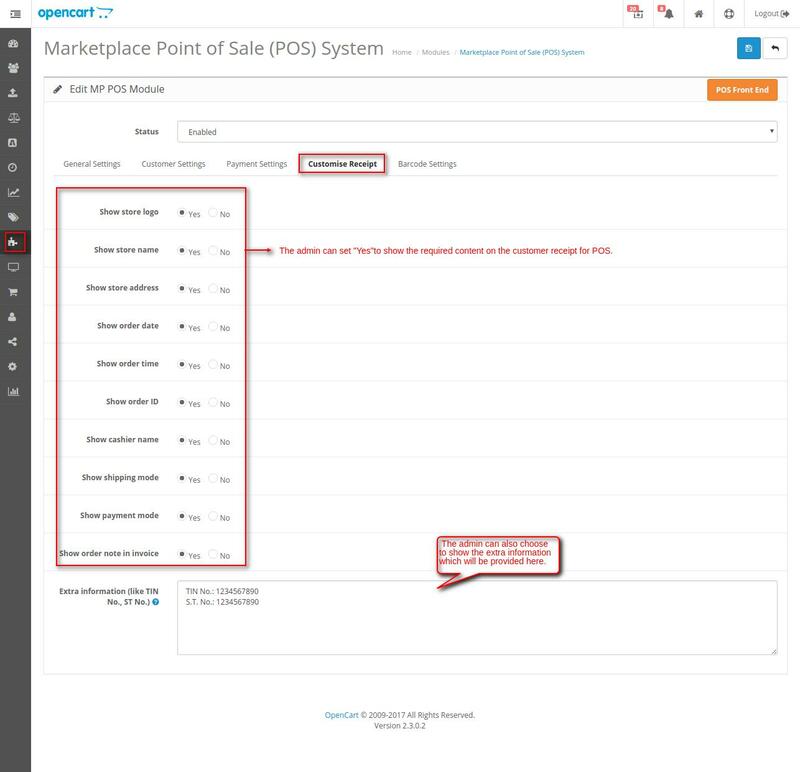 After saving the configuration, the seller can see the Use POS and Manage POS Product tab at their My Account panel. The seller can have their POS outlet. The seller can add products to his/her POS and can use POS system from his/her seller account. 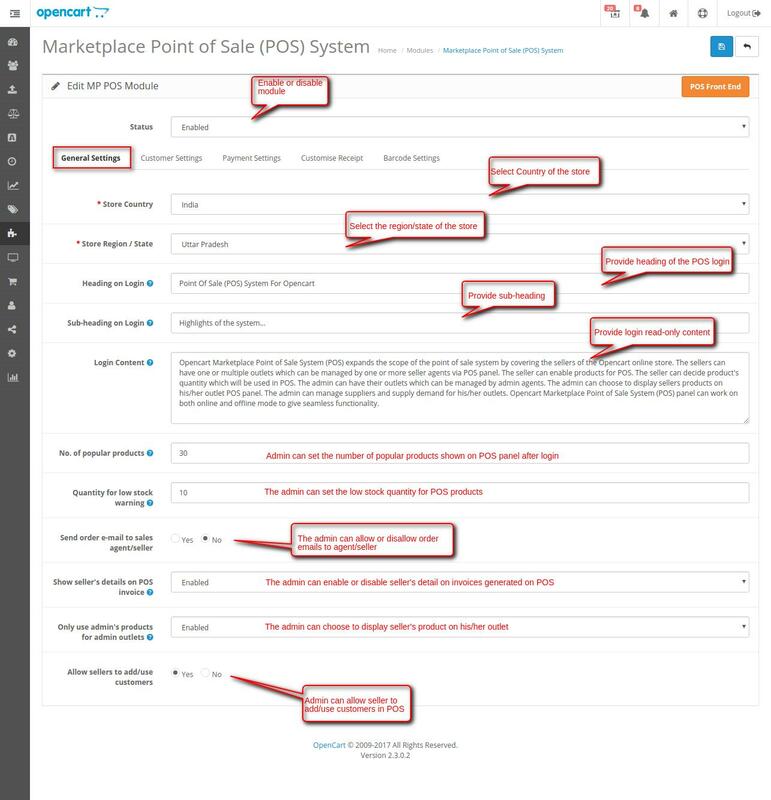 The seller can manage POS products by navigating to the Manage POS Product tab from the seller my account panel. The seller can search products by using the filter based on Product Name, Price, Status, POS Quantity, Model, and Quantity. The seller can enable products for his/her POS via “POS Status” column. The seller can Assign POS Quantity of the product via “Assign POS Quantity” column. The seller can print barcode of the product via “Print Barcode” button present in the “Action” column. The seller can also decide the number of copies required by mentioning the number copies in the pop-up. The seller can print barcodes of the products by “Mass Print Barcodes“. The selected products’ barcode can be printed in the required number of copies. The seller can go to seller POS panel by clicking on “Use POS” tab present at the seller’s my account panel. After the successfully Login, the POS user (sales agent) will be redirected to the POS System (fronted) where he/she can view the all the categories, products, and checkout panel. Also, the POS user can manage his account information and can view the orders list (a list of orders which is generated by the sales agents). The Popular Category will have all products that have high selling rate or most purchased items/products. The 3 symbols (Warning, Question mark, and Star) have the details about the particular products. Warning – The product is out of stock and you can’t add that product to the cart. Question Mark – The product with custom options. Star – The product has the offers/discounts. 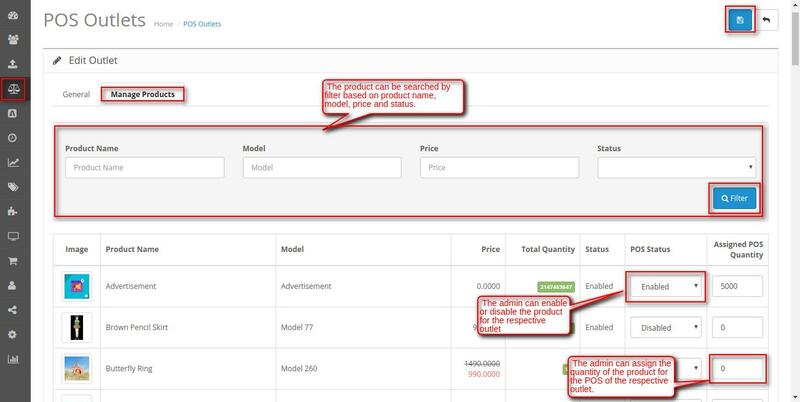 Solution-In the Orders Panel, the user can see all the orders which have been sold by him/her. Also, the Sales Agent (POS user) can view the order details and can print the receipt of that particular order by clicking on the Print tab. 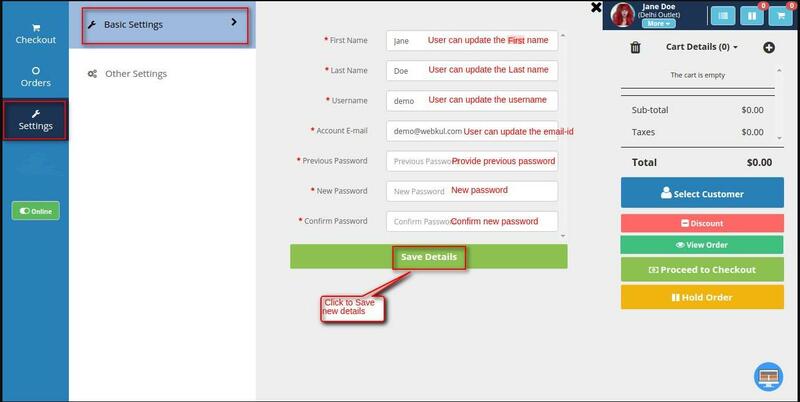 In user Setting Panel, the user can view or change his/her account information and also can change the password. Also, He/she can change the language and currency for the POS system. From product search feature, the user can easily search any products by entering the keyword of the particular product. The user also can add to cart the product from the search result. 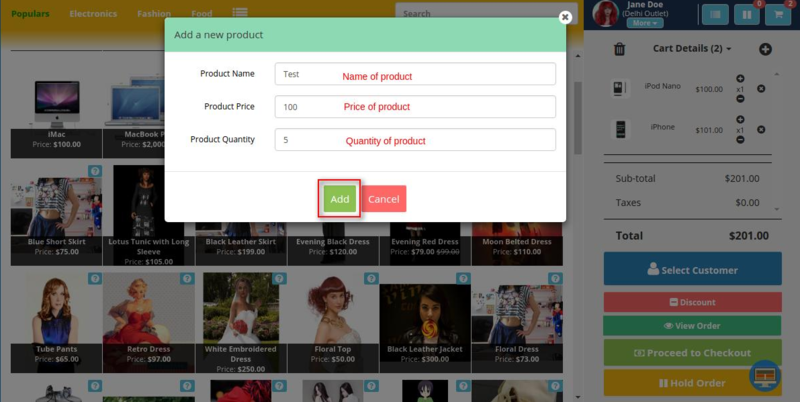 The user can add products to the cart and can select the customer for the particular order. Adding custom products to the cart is as easy as adding a normal product to the POS cart. A custom product can be something like a warranty for a product, a service, or a product that is not in the physical store but that’s launched. Now, after you have added products to the cart and if you want to add custom product just tap on the “Add” button as shown below in the snapshot. After entering the info. for the custom product, just click the “Add” button on the pop-up to add the product to cart. After the custom product gets added to the POS cart you can see the product, remove the product, increase or decrease the product quantity in the POS cart. If you want to change the price for a product that is already added to the cart, you just need to tap on the product’s price when it’s in the POS cart. After tapping the price, a pop-up will appear wherein you can change the price/ set the custom price of the selected product. After taping the “Apply” button in the above snapshot you can see the price of the product in the cart will get changed. After that, when POS user needs to click on Select Customer tab. Here he/she can select the customer. If the customer is already registered then the POS user can search the customer through the customer’s name or mobile or telephone number. 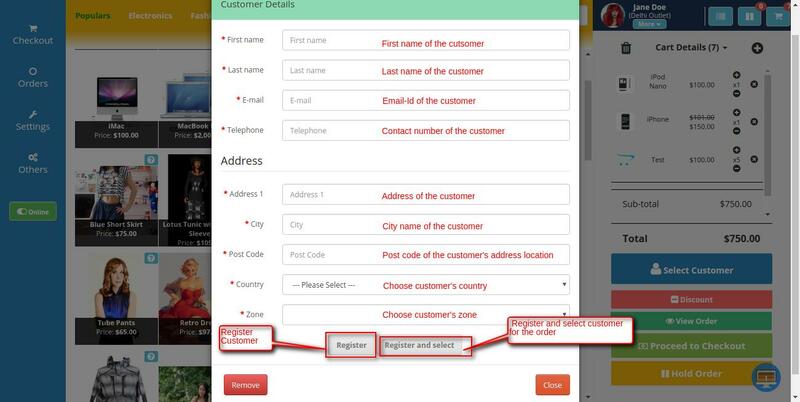 If the customer is not registered yet then the POS user can add/register the new customer and can proceed to Checkout. After clicking on the Add Customer, a pop-up will be opened for Customer Details. The POS user needs to fill the all the required details to save/register the customer. The seller’s sales agent can give the discount on the Total Amount of the Cart by using the discount tab. The sales agent can give the discount offers as Fixed Amount or Percent (%) Value of the Total or can apply both the discount methods together on the Total. After we click Apply, the discount is reflected in the sub-total detail. When the POS user (Sales Agent) will click on the Proceed to Checkout tab then a checkout panel will be opened where the POS user can select the payment method and can accept the payment for the particular order or the user can also hold the order and can complete later. The POS user can add a note about the transaction. After accepting the payment, a pop-up screen will appear on the Invoice. The sales agent can Print Invoice or can Skip this step to complete the checkout process. Now, the cart will be empty for the other orders. Apart from the cash payment, you can also make use of the card payment by making use of an external card swiping machine. 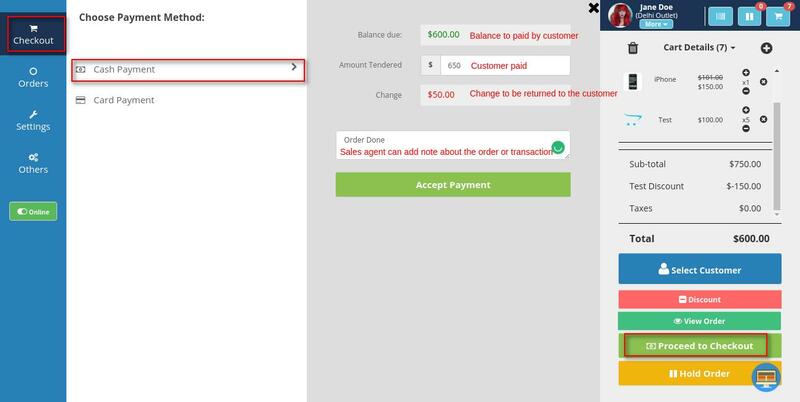 Clicking the Proceed to Checkout tab brings a checkout panel where the POS user can select the payment method as card payment and can accept the payment for the particular order. If the agent selects Card payment then, he has to enter the name of the card being swiped(as a record) for the payment and tap the “Accept Payment“. After this, the agent will have to confirm a pop-up on the window as shown below. After this, the agent can take out the printout or skip this step to proceed further. Now, you can check the order by going to the “Orders” section of the POS system and here you can check the mode of payment with the selected card for making the payment. The POS System for Opencart provides the most valuable and unique feature so that your sales agent, cashier etc. can work on POS system in offline mode also. They can use all the functions and features of the POS in the offline mode. They can complete all the transactions without the use of the internet. This feature will also benefit you when you are having your store in poor internet connectivity area or no internet area. They can view all the transactions or orders that they have made in offline mode in the Orders > Offline. As you can see in the below image. 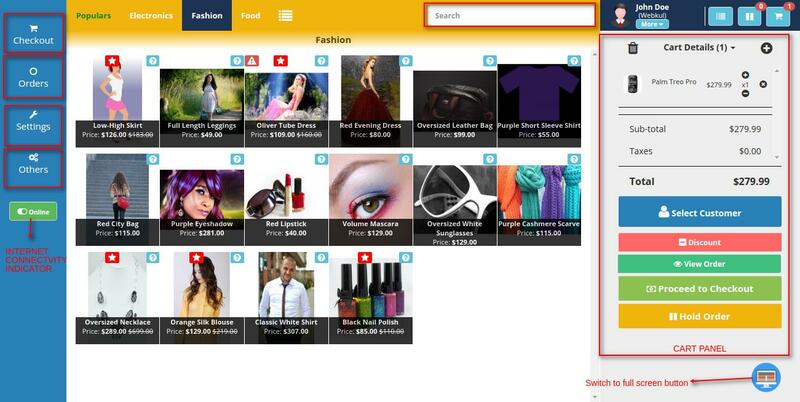 When you or cashier or sales agents have the internet connection or in online mode then you or they can sync all the offline orders to the online Opencart Store. The Sales Agent can hold the transactions at any time. He/She can easily proceed to next the transactions/orders without deleting the uncompleted order/hold order. When the sales agent will hold the order then he/she can Add a Note to mention the reason for holding the order. The Sales Agent can view all the hold orders under the Orders > Hold Order. 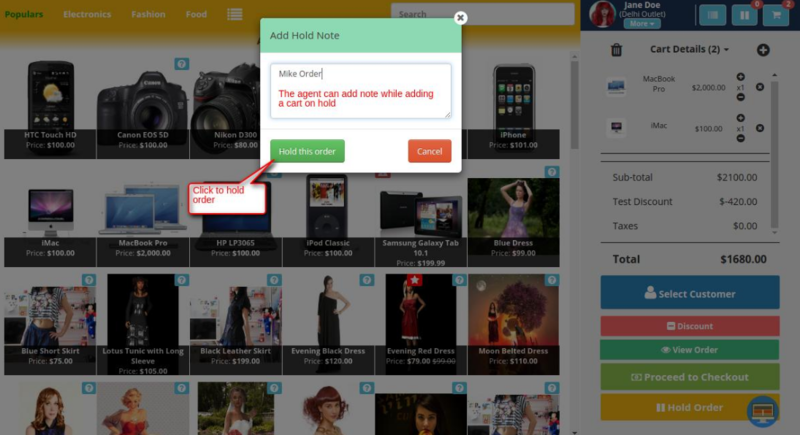 When the sales agent will click on any hold order then the hold order will be redirected to the cart and the sales agent can view the order details and can Proceed to Checkout. The admin user can easily Login the POS System (fronted) by using the Username and Password which is created by Admin. After entering the information for the custom product, just click the “Add” button on the pop-up to add the product to cart. After the custom product gets added to the POS cart you can see the product, remove the product, increase or decrease the product quantity in the POS cart. The sales agent can give the discount on the Total Amount of the Cart by using the discount tab. The sales agent can give the discount offers as Fixed amount or Percent (%) value of the Total or can apply both the discount methods together on the Total. In the Other section of the POS, the sales agent will find three options like – Low Stock Products, Request, and Request History. 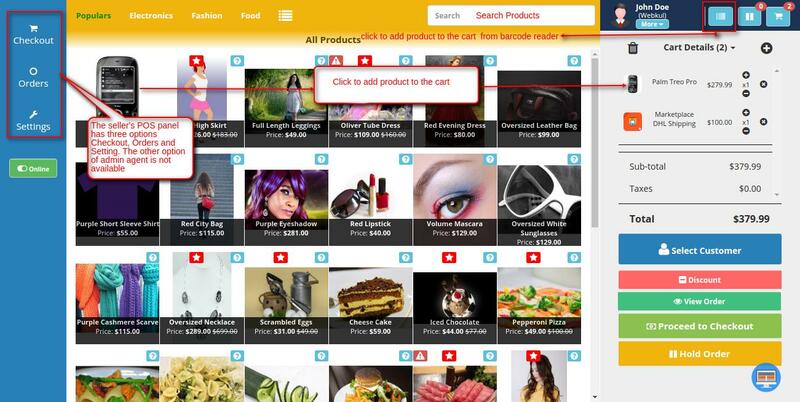 In Low Stock Products Section, the sales agent can view all the products which have low quantity in the stock. The low stock quantity that you can set from the admin backend panel. In the Request Section, the sales agent can create a request to the supplier to fulfill the stock. The sales agent can generate a request with product quantity that he/she needs to fulfill the stock with the product details. The sales agent also can choose the supplier to fulfill the request. He/She can create multiple requests at a time. In the Request History section, the sales agent can all the request that he/she has created against the supplier to fulfill the stock. He/She can also check the request date, request details and the status of the request. For any query or doubt, Please add a ticket at https://webkul.uvdesk.com/. 1. does it support multi-store model ?? 2. this is multi-vendor model right ?? 2. Yes, The module will work with the Multi-vendor model.